Last Monday, Newcastle and Manchester City played for their highest hopes - City aiming for the title, of course, after defeating Manchester United a week ago, and Newcastle still holding on to the dream of Champions League football. Even though it was an interesting match, we will focus on specific aspects and how they translate a different vision of football. Indeed, this was one of the best examples of how English and continental football fare against each other. Just like Roberto Mancini, Newcastle manager Alan Pardew chose to keep the team that won at Stamford Bridge a few days ago intact, which meant the Magpies were something of a hybrid 4x4x2, because Gutiérrez plays much narrower and helps out more defensively than Ben Arfa. Additionally, Ba played just off Cissé, drifting to the left. Manchester City, in turn, also maintained their starting eleven and their approach, even though Yaya Touré was a bit more restrained than usual - that is, up until when he was moved forward. With Nasri, Tévez and Silva, they were extremely mobile and, due to their forwards' size, kept charging down the wing. As explained, the two teams were very different in their approach. Newcastle resembled a typical 90's British team. With Ba and Cissé, they were unafraid to hit the ball long and stick to route one (especially the goalkeeper Tim Krull), usually with Ba trying to flick the ball towards Cissé. Whenever that didn't work, they turned to Ben Arfa in hope of a more individual option. On the other hand, Mancini's men stuck to their favourite intricate passing. As mentioned, Touré was concerned with his defensive duties, but the Citizens kept motoring down their right wing. Unlike their opponent, they overloaded the wings, especially when Tévez drifted towards that side, along with nominal right-winger Nasri. With Cabaye further up, Tioté had to decide whether to slide over and leave the middle open or leave it to Santon and Gutiérrez. More often than not, he went with the second option. This was a perfect example of how the strategy of two banks of four can be outwitted. Newcastle used this rediscovered approach and were made to pay for it. 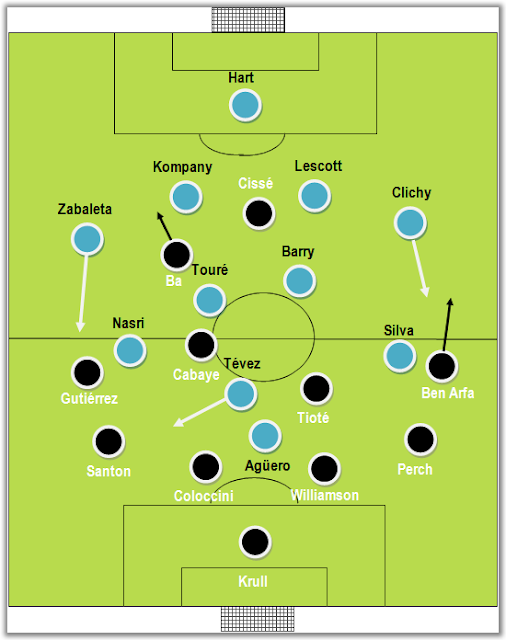 By affording to leave at least two men high up (Ba and Cissé, and sometimes Ben Arfa), Newcastle were constantly overrun and outpassed with simple triangle movements, even though they are a very well-drilled team defensively. Nevertheless, it was odd not to see a perfectionist such as Pardew make the necessary adjustments at half-time. It was clear that Mancini studied his opponent and he deployed Touré on the right of the central partnership with Barry to help Kompany and Zabaleta on the aerial duels against Ba and Cissé. By doing that, his men were able to keep Newcastle at a distance, since their favourite out-ball was smothered. Here, Mancini proved once again that he prefers a cerebral approach (the continental way) over a emotional one (the British way). City's only mistake throughout this match was the freedom they conceded to Ben Arfa, who could have proved decisive, but their manager was wise enough to introduce Nigel de Jong so that Barry could keep an eye on Ben Arfa. Another important difference was how both teams reacted when they gave the ball away. With their 4x4x2-ish shape, Newcastle were often caught off-guard either because they couldn't get back into shape quickly enough or because Cabaye couldn't find find the legs to track back. On the contrary, Barry and Touré kept their ground and both centre-backs (especially Kompany) showed no hesitation in moving high up to break Newcastle's moves. With two physical imposing forwards as they have in Ba and Cissé, it's odd that the side they choose to attack down - the left - is filled with two players who cannot cross a ball with their left foot and who both have the tendency to drift inwards. When both teams started to lose their shape (Silva rarely tracks back during second halves), the Magpies could have hurt City, but neither Santon nor Gutiérrez were able to deliver the cross. All in all, it was an interesting and evident clash of styles between two very distinct football philosophies. City were closer to their full potential, while Newcastle's frailties and lack of a plan B were there for everyone to see, even though there are some real gems in their team - Cabaye immediately springs to mind, along with Cissé, of course.